Yes, rattlesnake. In my freezer. SP bought it at Giant Eagle Market District last weekend. I'm not sure what I imagined, maybe I thought it would come bundled up in that white butcher paper, but it looked like this when he got it. I took the photo after it had been in the freezer for a day, so you can't really see what it looks like, but honestly, I'm glad that I can't really see it. The distinct round snake curl is enough for me. I won't even open the freezer door right now. Yes, I am a girlie girl - completely scared of snakes. Sammy the Harmless Snake who shed his skin in our yard and sunbathed on our front patio? Don't like him. Wish he'd slither off to another yard. SP's pet corn snake Vermithrax (I think was her name) - she ate mice that he kept in his freezer - secretly so happy she decided to die 2 months before we moved in together. Really not sure how I would have dealt with an orange snake in the basement and mice in my freezer. Just how does one cook rattlesnake? I googled 'how to cook rattlesnake.' I should not be surprised at the abundance of sites addressing that question. 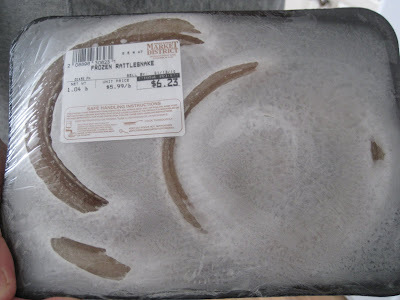 Did you know you can cook rattlesnake de-boned or with the bones? Yeah. Ick. I can barely type that. Supposedly it has a gamey flavor like frog legs, elk, or alligator. I found recipes for rattlesnake chili, rattlesnake BBQ, fried rattlesnake, rattlesnake kabobs, rattlesnake stew, rattlesnake cilantro soup, baked rattlesnake... apparently this southwestern USA delicacy is quite versatile. I'm happy to say that we will not be cooking and eating rattlesnake any time soon. SP purchased this for a co-worker who is from France and who expressed an interest in trying some of the more 'unusual' meats, one of the 'fresh game selections' sold at the Robinson Market District. He asked SP to buy it for him. 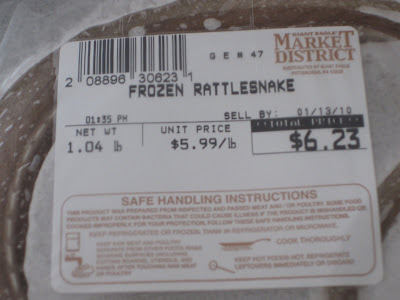 Thankfully, the rattlesnake is no longer in my freezer. I understand that rattlesnake is edible. I get that some find it darn tasty. I know that other cultures dine on snake routinely. But I am not that adventurous. I can blame my sensitive stomach for my reluctance to try something like rattlesnake, but really I am just a horrible, narrow-minded, unadventurous American. I have unwittingly eaten whale in Japan. It's possible I also unwittingly ate horse meat in Japan. But I just cannot imagine sauteing up some rattlesnake. If I ever did, I think I might have to throw out that saucepan afterwards. I hope Co-Worker From France enjoys this. I admire him for trying it. I'll try to have SP find out how CWFF cooks it and what he thinks of the taste.